Medals Awarded / Medalau a ddyfarnwyd: 1914 Star. Victory Medal. British War Medal. Ivor died of Bronchial Pneumonia after demobilisation on 26th February 1919. He was 30 years old. Ivor Griffiths was born in Gwaenysgor in about 1889. 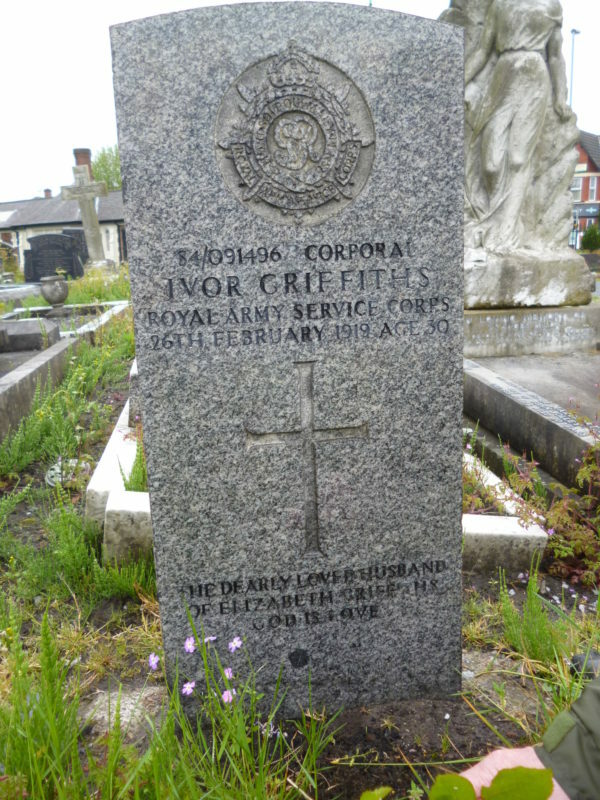 He was the son of Jonathan & Winifred Griffiths. Census returns show that he had two brothers and three sisters. The 1901 census records Ivor living with his parents in Gwaenysgor. He is shown as the only child at home. His Father’s occupation is recorded as “Boot Maker”. The census also recorded that they spoke both Welsh and English. By the time of the 1911 census, Ivor’s parents had moved to live in Llangefni. Ivor himself, was living at “The Stores” High Street, Prestatyn, where he was employed as a Grocers Assistant, by the owner, William John Williams. According to his Flintshire War Memorial Record Card at the Records Office in Hawarden, his period of military service was from, 6th September 1914 to 26th February 1919. That record card confirms his address as, 7 Parliament Street, Rhuddlan. The card also records his death from Bronchial Pneumonia shortly after demobilisation. At the time of writing, I have been unable to find any details of his military service. He is buried in Warrington Civic Cemetery, the cemetery records give his wife’s address as 62 Parker Street, Warrington. He is commemorated on the Rhuddlan Memorial, The Royal British Legion Scroll of Honour [inside the Community Centre] the Scroll of Honour in St Mary’s Church and the North Wales Memorial Arch at Bangor.